There's only so much ramen a human can eat. At some point, even a college kid or 20something has to learn to cook something. Here's a round-up of learn-to-cook cookbooks to help. Giving one as a gift? Pair it with a whisk and an adorable DIY ruffled apron. 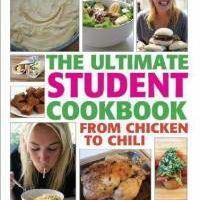 Tiffany Goodall's book is an irresistible addition to the college student cookbook genre. It's written by a London-based chef still close enough to her own student days to remember exactly what it was like. Goodall balances the basics with fun, globally-inspired, 20something-pleasing fare. But the real strength of the book lies in the photos - 6 to 16 per recipe - that show every aspect of meal prep. Read the full review here. Sam the Cooking Guy: Awesome Recipes and Kitchen Shortcuts. Strictly speaking, this isn't a cooking-in-college cookbook. But it's a terrific book for any college kid or 20something looking for easy, delicious recipes. From the photos and fonts to the instructions and sly asides, it's a clear winner, especially for guys. These recipes can be done by any beginner, but they can be served to even the most sophisticated crowd - or eaten, standing, over the sink. Read the full review here. This book from the UK brims with great ideas, loads of ethnic foods and photographs. It's enough to inspire anyone. But many of the recipes require a fully-loaded kitchen - i.e., more than a dorm room's microwave and fridge. And several of the recipes needed tweaking to make them more flavorful. That said, there's still a lot of fun to be had here. Read the full review here. This cookbook for 20somethings was inspired by a supper club six young New Yorkers launched a decade ago. These young women, all working entry level jobs and fed up with takeout, would meet one night a month to cook, try new recipes and reconnect with each other. After reading about the club and those tasty theme night dinners - a Far East Feast, Spanish Tapas, Comfort Food Night and nine others - your 20something will want to start his or her own cooking club too. Read the full review here. Who understands the woes of college cuisine better than students? Fed up with mystery meat and other cafeteria fares, three Williams College students - Alexandra Nimetz, Jason Stanley and Emeline Starr - teamed up to write this classic cookbook for university students. The book - with its signature recipes for savory baked ziti, garlic green beans, banana chocolate chip muffins and more - has gone through 17 printings. Now it's been completely revamped. The new edition, due out Dec. 31, 2008, has 100 new recipes for breakfast favorites, grilled fare using the always popular George Foreman Grill, homemade pizza options and more. From knife skills and pantry basics to tasty, simple recipes, Jean Patterson and Danae Campbell's cookbook is an excellent intro to non-ramen fare. 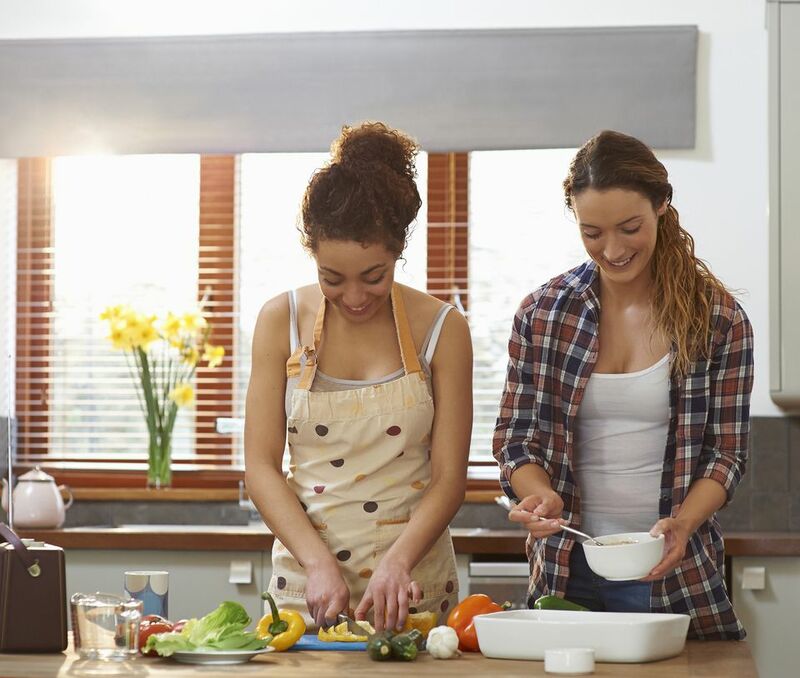 Among the offerings: fajitas, teriyaki chicken, and other teen-pleasing cuisine, plus a "Don't Let This Happen To You" troubleshooting section that will help avoid kitchen disasters. With chapters on devoted to avoiding the Freshman Fifteen in the most glamorous way possible - Szechuan chicken, for example, spicy lettuce wraps - as well as "cheap eats" and party menus for Oktoberfest, Toga Parties, and a Tapas Spread, this is an enticing read. Sisters Megan and Jill Carle's third cookbook for college students is a good one, but it's intended for an audience that actually possesses a kitchen, as opposed to a microwave by the laundry hamper. Rhonda Parkinson's classic cookbook purports to offer 300 hassle-free recipes, but it also walks newbie cooks through the terminology (blanch? dredge? simmer?) of cooking and offers plenty of alternatives. Buttermilk isn't exactly a normal fridge ingredient for most college-aged cooks, so Parkinson's recipe for blueberry muffins offers alternatives. Practical? Yes. Tasty? Yep. Requires a full fledged kitchen with working stove and oven? That too. And it's a vastly better book than the repackaged version her publisher released in 2010 as "The $5-a-Meal College Cookbook.". More seasoned young chefs with a fully operational kitchen may be ready to graduate to Mark Bittman's newly revised, award-winning cooking bible, which features 2,000 simple, straightforward recipes for wonderful food, including chicken kebabs and roasted shrimp with mint sauce. This book makes a great gift for newlyweds too.